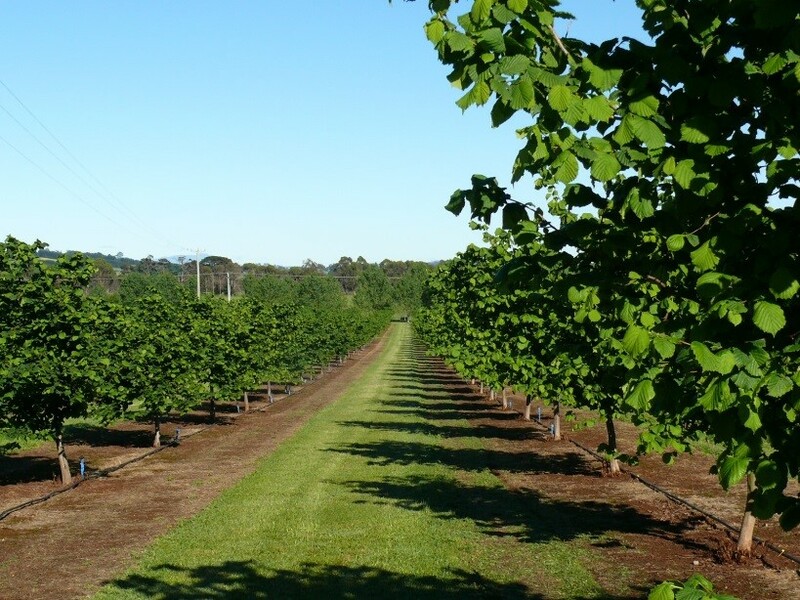 Since the first plantings in 2005, Hazelbrae has planted over 5000 Hazelnut trees across 18 Hectares of the property.The majority of these plantings being of Barcelona and TBC varieties, interspersed with other pollinators, were chosen for their flavour, quality and suitability for the local climate.In Tasmania, Hazelnuts are harvested through early Autumn (March - April) when they drop from the trees and are picked up by a mechanical harvester. Being a member of the Birch family of trees, the leaves drop shortly after harvest leaving the male pollinators, or catkins, exposed. During winter, the trees flower and accept pollen from the catkins via wind pollination; however fertilisation doesn't occur until spring (late September). 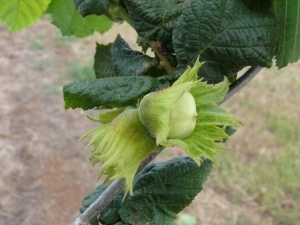 Since Hazelnuts must be cross pollinated, new tree stock is grown from suckers, not the nut seed itself to ensure genuine varieties are replanted as this has a great impact on the success of the cross pollination and nut production. Did you know that the Hazelnut tree has been known throughout history as the tree of knowledge and wisdom? Modern science can now attribute this to the high B1 (Thiamin) and B6 content of the nut which supports healthy brain function. Hazelnuts are also full ofprotein, vitamins A & E, folic acid, and Omega 9 which assists in reducing blood pressure, risk of stroke and memory loss. Hazelnuts, once dried and stored correctly, can be kept in-shell for up to 3 years. After cracking, raw nuts begin to lose their creamy sweetness and may become bitter or rancid due their high oil content, after as little as a few months, and those roasted even less. Hence, at Hazelbrae, we pride ourselves on cracking to order and encourage customers to purchase regularly to ensure the quality of the product. After collecting the fallen nuts from the grove, we dry them out to 5-10% moisture content before storing them for cracking as needed. Before cracking, we send the nuts through a machine which separates the nuts into similar sized groups. 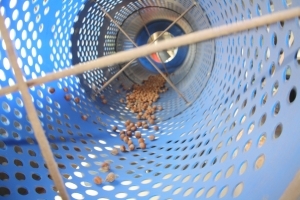 This makes it easier for the press to crack the nuts consistently and minimises the amount crushed or uncracked because they are larger or smaller than the rest. During cracking, the shell and kernel are separated by air and the kernel falls onto the belt for final inspection before packing or further processing.